PARIS, France -- The truck driver who killed 84 people on a Nice beachfront had accomplices and appears to have been plotting his attack for months, the Paris prosecutor said Thursday. Prosecutor Francois Molins said five suspects currently in custody are facing preliminary terrorism charges for their alleged roles in helping 31-year-old Mohamed Lahouaiej Bouhlel in the July 14 attack in the southern French city. Molins' office, which oversees terrorism investigations, opened a judicial inquiry Thursday into a battery of charges for the suspects, including complicity to murder and possessing weapons tied to a terrorist enterprise. The suspects are four men - two Franco-Tunisians, a Tunisian and an Albanian - and one woman of dual French-Albanian nationality, Molins said. 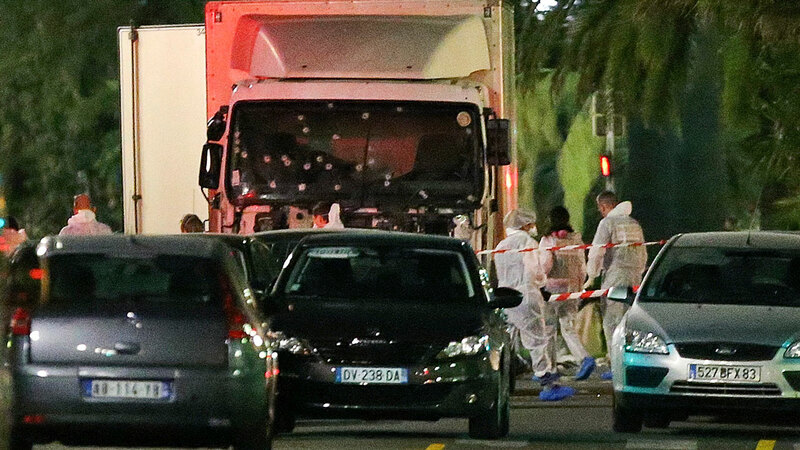 The driver was a Tunisian man who had been living in Nice for several years. People close to Bouhlel said he had shown no signs of radicalization until very recently. But Molins said information from Bouhlel's phone showed searches and photos that suggested he could have been preparing an attack as far back as 2015. The Islamic State group has claimed responsibility for the attack, though authorities have said they had not found signs that the extremist group directed it. Earlier Thursday, French officials defended the government's security measures in Nice on the night of the Bastille Day attack, even as the interior minister acknowledged that national police were not, as he had claimed before, stationed at the entrance to closed-off boulevard during the attack. Interior Minister Bernard Cazeneuve's clarification comes after a newspaper accused French authorities of lacking transparency in their handling of the massacre. Cazeneuve said Thursday that only local police, who are more lightly armed, were guarding the entrance to the Promenade des Anglais when Bouhlel drove a 19-metric ton (20-ton) truck onto the sidewalk in Nice before mowing down pedestrians who had gathered to watch a holiday fireworks show. Cazeneuve then launched an internal police investigation Thursday into the handling of the Nice attack. President Francois Hollande said the conclusions of that investigation will be known next week. He said any police "shortcomings" will be carefully addressed but defended French authorities' actions. "There's no room for polemics, there's only room for transparency," he said. "The necessary, serious preparations had been made for the July 14 festivities." Earlier, the French newspaper Liberation said Cazeneuve lied about the whereabouts of the national police officers and cars in Nice that day and accused authorities of lacking transparency. Using witness statements and photos, Liberation showed Thursday that only one local police car was stationed at the entrance to the Nice boulevard on July 14. The paper quoted Nice police officer Yves Bergerat, who said local police forces' guns and bullets aren't even equipped "to puncture the tires" let alone shatter the windshield of a truck that size. Cazeneuve accused the paper of conspiracy theories and said several "heroic" national police - who killed the attacker after an exchange of fire - were stationed further down the promenade. The criticism comes as the National Assembly extended France's state of emergency for six month. The security measure had been in place since the Nov. 13 Paris attacks that killed 130 victims and were claimed by the Islamic State group.